Smart speakers are one of the hottest trends in tech right now, with Amazon and Google trailblazing the path with Alexa and Google Assistant-enabled devices. But as nice as these speakers can be, they offer little to nothing outside of their intended purpose. Amazon wants to change this by allowing companies to integrate Alexa into... lamps. Yes, lamps. Amazon has released its first reference design guidelines for building Alexa-enabled smart lamp that features a microphone and speaker. So is it really a smart lamp with a speaker or a smart speaker with a lamp tacked on? Hmm... Either way, Amazon has shown off three Alexa-enabled white-box solutions offered by different OEMs, and all three designs come in the cylindrical form factor that has come to define Amazon's lineup of smart speakers. Only one of them, however, called the Adition, has a lamp built-in. These white-box solutions, or design templates, have been approved by Amazon and can be used by other manufacturers to bring Alexa-enabled products to the market. "We envision a world where Alexa is everywhere, accessible through any connected device. In this world, you will be able to walk into a room and simply speak to Alexa, to get news updates, control smart home devices, and enjoy entertainment hands-free," said Alexa Business Development Principal Mariel van Tatenhove in the official announcement blog post. 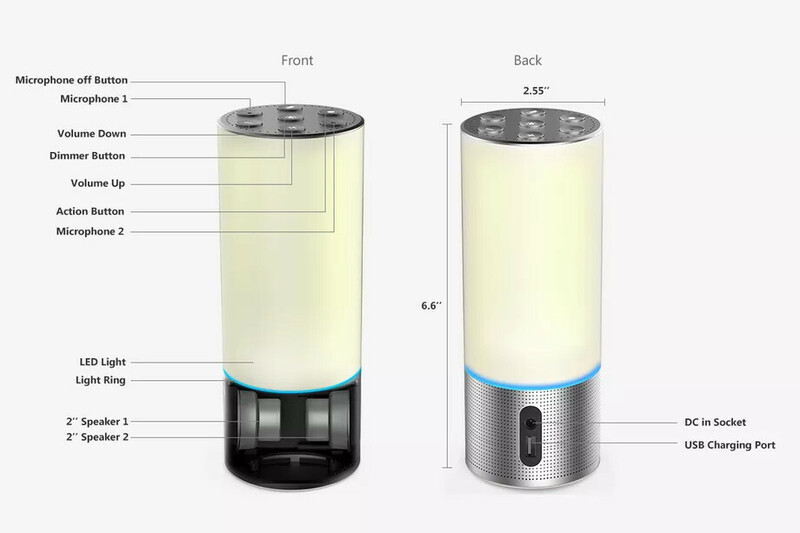 The Adition lamp looks very similar to the Amazon Echo, although it's white. It features two microphones, two speakers, Bluetooth and Wi-Fi connectivity, and support for multiple music services. Its stand-out feature is, of course, that it can also illuminate your living room with the ability to dim the light on demand. Companies will be able to use this template design, tweak it to their liking, and quickly bring their product to the market. Sleep tracking or just an expensive bed lamp? What's next??. Digital assistance enabled toilets? ?